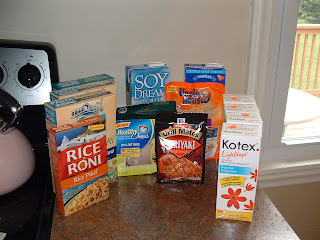 Frugal & Fabulous: STOP & SHOP: free pasta roni and more kotex! STOP & SHOP: free pasta roni and more kotex! 3 Pasta Roni ($1.00) used three $.50/1 coupons that doubled=FREE! 1 Rice a Roni ($1.00) used a $.50/1 coupon that doubled = FREE! 1 Healthy Ones Deli Turkey ($1.79) used $.75/1 coupon doubled = 29 cents! 1 Mccormick Grill Mates Marinade ($1.00) Used $.25/1 doubled = 50 cents! 1 Silk Soy Milk ($2.19) used $1/1 coupon (sent compliment email) = $1.19! 1 Soy Dream Soy Milk ($2.50) used $.75/1 = $1.00 ! 1 Uncle Ben's Cajun Rice($2.37) used free item coupon from Start Sampling= FREE! 4 Kotex Liners ($1.29) used four - $.75/1 coupons doubled to $1.29 ea = FREE! Looks like I'll be stopping at S/S this week for my pasta roni!! Thx!